Amon Hen IV ~ Frodo's Flight. In the book, after Frodo’s frightening visions in the Seat of Seeing at the top of Amon Hen, he makes his decision, slips on the Ring, and disappears: "He vanished and passed down the hill, less than a rustle of the wind." There is no further tumult until he is pulling away from shore at Parth Galen and Sam flings himself into the water to follow him. In the film, it is quite different. 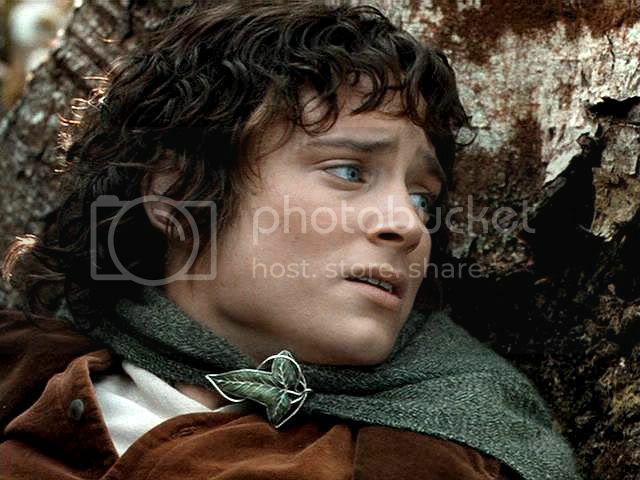 Much of Frodo’s internal wrangling about going or staying, which is expressed in internal dialogue in the book, is moved to the scene shown in the caps below. 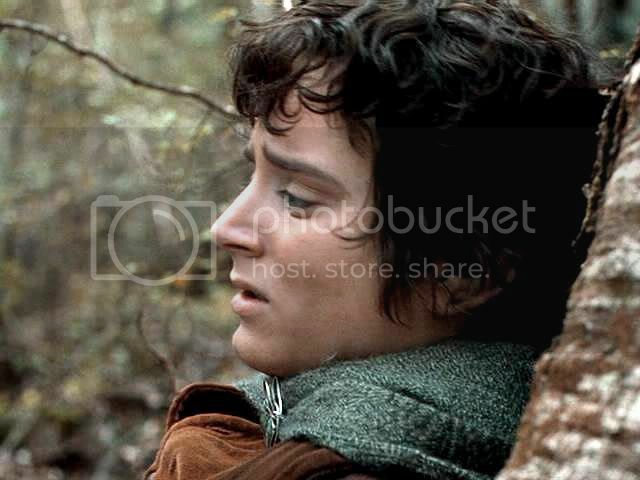 It is a scene in which Frodo has no lines. 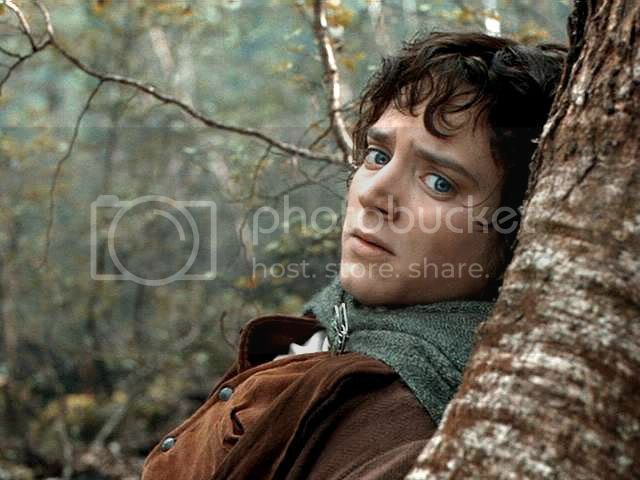 Instead of invisibly and quietly moving through the woods to the boats as he did in the book, Frodo is in haste, certain he is pursued by Orcs. In the film's preceding scene, he and Aragorn have been interrupted by a force of Uruk-hai at the top of Amon Hen. 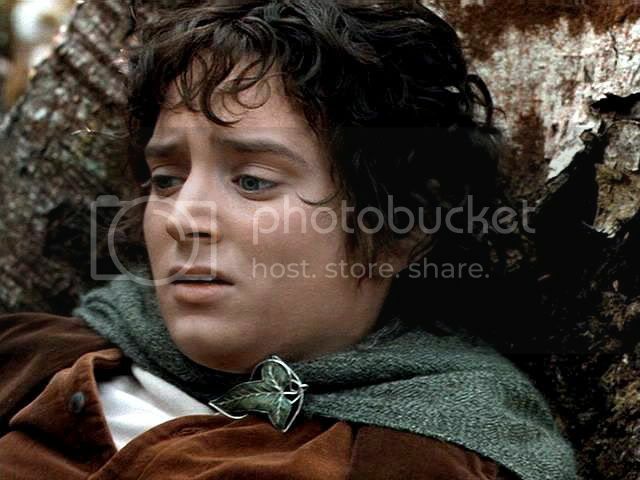 Commanded by Aragorn, Frodo has dashed away and is shown careening down a hill (quite a contrast from the last time we saw him careening down a hill, at the sound of Gandalf’s cart arriving in Hobbiton). 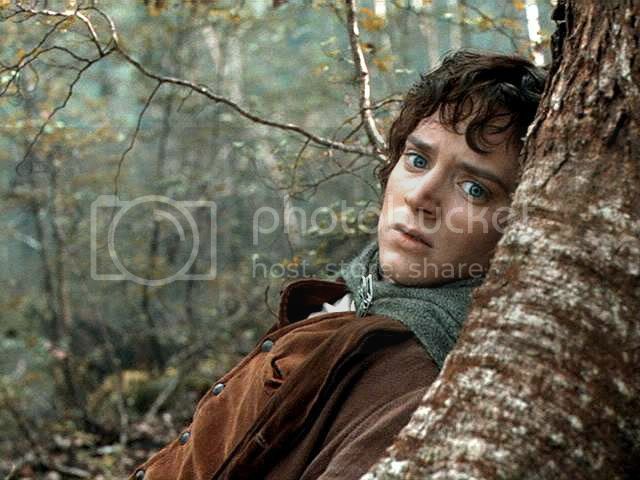 Panting and alarmed, Frodo throws himself behind a tree. From the swiftly changing expressions on his face, his thoughts and feelings are in a roil. 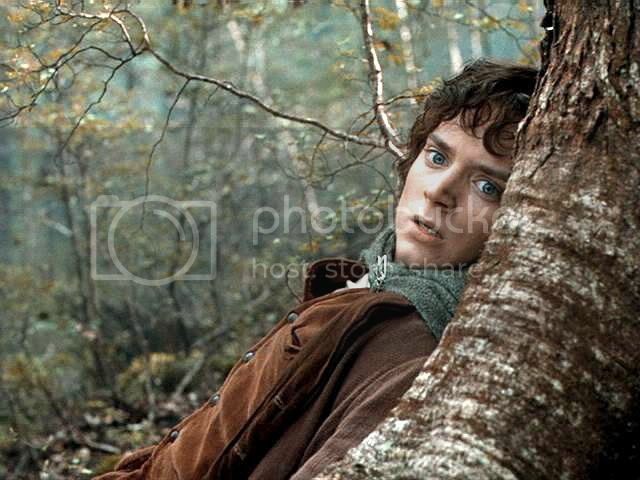 Just opposite, it turns out, Merry and Pippin are hiding from another party of pursuing Orcs. Come and hide with them, they urge. 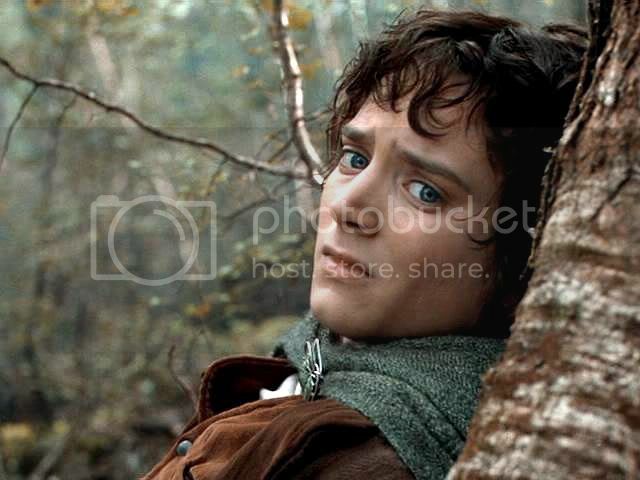 But, no, Frodo signals with a forceful shake of his head; he won’t. 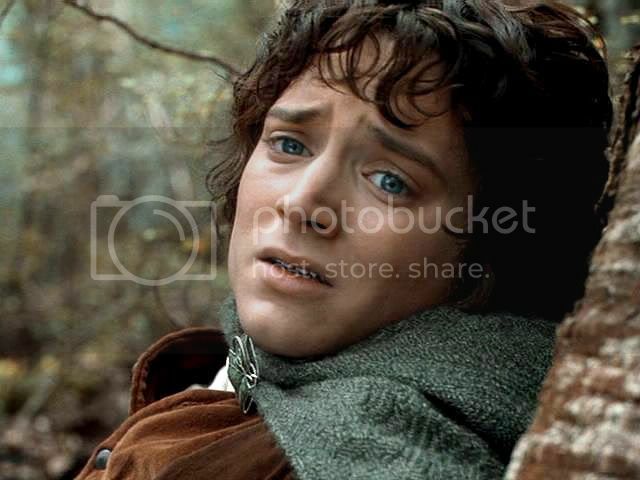 It is Merry who first falls to what, in this new crisis, has crystallized as Frodo’s plan: he will not be coming with them, he will go on alone. 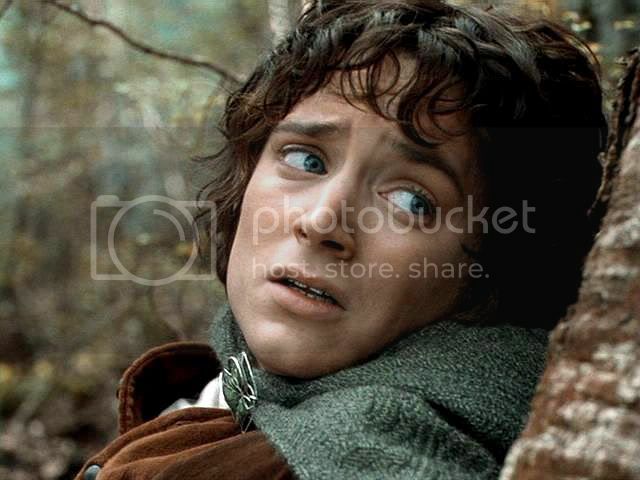 Frodo must – or risk capture, and the capture of the Ring. 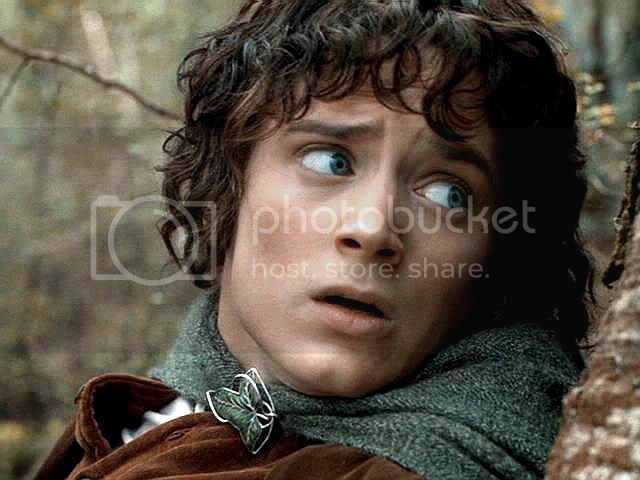 Merry and Pippin then leap out to create a diversion and Frodo escapes. 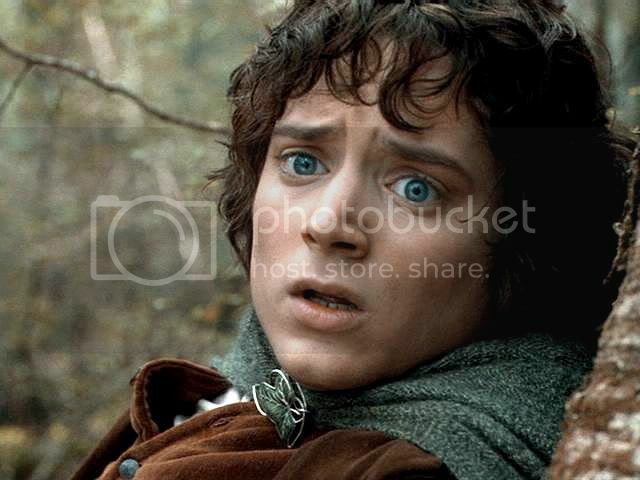 The camera’s coverage of Frodo’s reactions in this scene is superb, even for LotR. 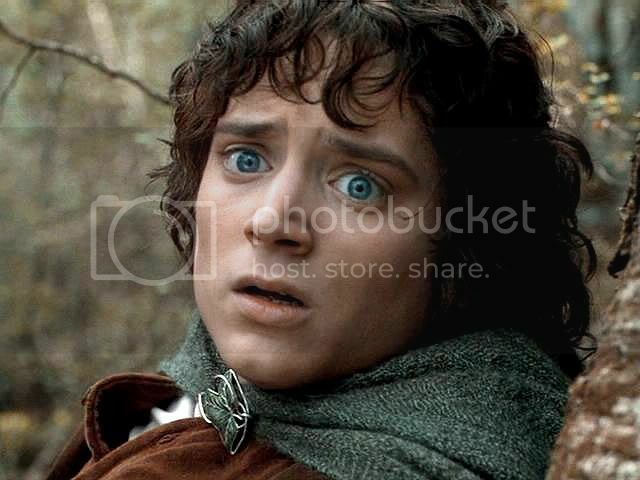 All of Frodo's reactions are filmed in close-ups that have notable clarity. I notice these things because I always have to brighten and sharpen my screencaps when preparing these presentations, sometimes quite drastically. But these caps I lightened and sharpened much less. Many of the frames are like works of art painted by a master, each demonstrating a nuance of human emotion: intense, specific and vividly clear. I almost cannot believe these frames were made from a real person, a living actor, they are each so perfect. They are also completely Frodo. 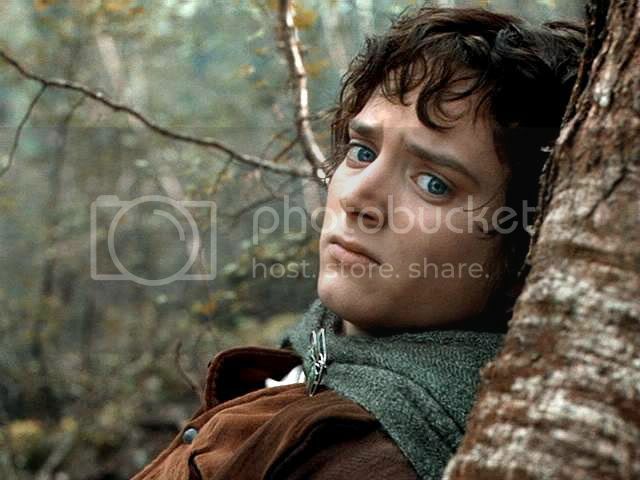 Elijah Wood often “disappears” into his role while playing Frodo, but, in these frames, I really can’t recognize him as the young man in the DVD extra’s, even when I mentally erase his mop of tossed, dark curls and his perfectly designed costume. 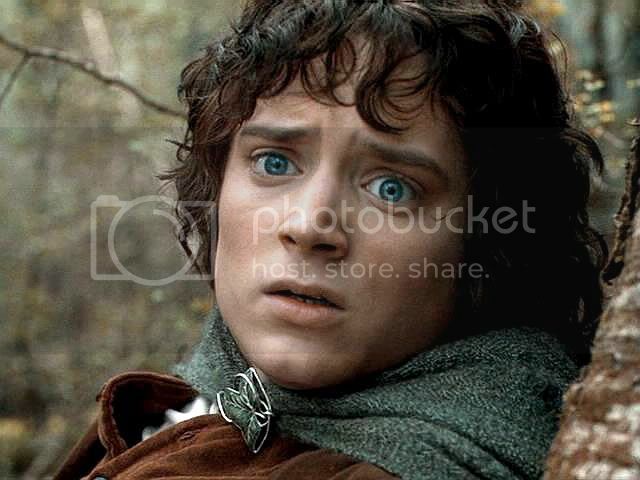 In fact, Elijah Wood’s entire face looks like someone else’s to me in these frames. 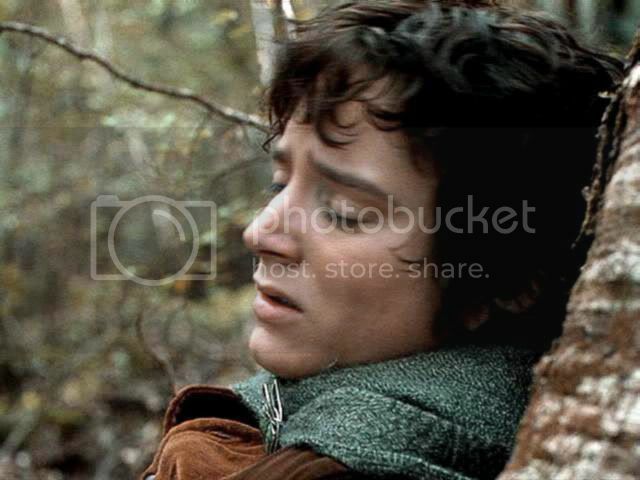 In these frames, Frodo's face even looks different to me than it does in the rest of the film. It is as if, in these caps, the inner transformation is so complete as Frodo makes his decision, it transforms his physical appearance. 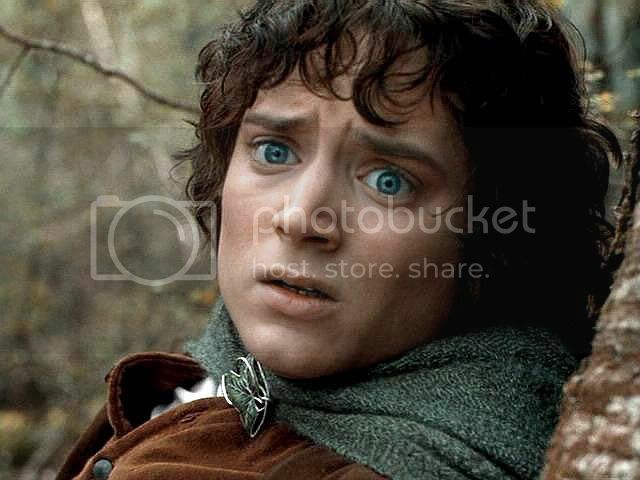 In these close-ups, film-Frodo looks to me like a Byronic hero (if hobbit-sized), a hero of epic proportions, who stands on the brink of doing something of Magnitude. Which is precisely what he goes on to do. Note: I worked hard to pare down the number of frames, but I could not bring myself to toss out any of these that follow. There are twenty-six caps, which may take a while on dial-up. But they are all gems. 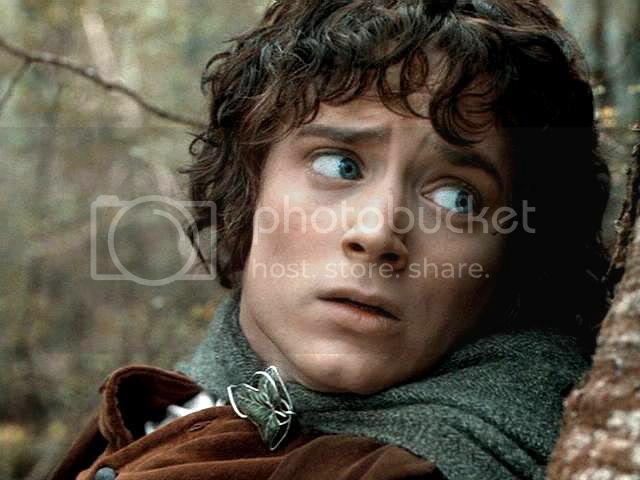 For other Frodo Screencap entries, see the table of links here. Yes, they are very vivid. Sooo amazing. Omigosh, how could Merry and Pippin not have leaped across that gap and grabbed him? As a matter of fact, yes, if you are talking about the "Farewell smile." I made them when I was looking for a particular face I wanted to use for a Frodo Art Travesty, Bronzino's "Portrait of an Unknown Man," which I did in April. I made them, tweaked them, and put them in the the file for "later". "Later" still hasn't come yet, though. 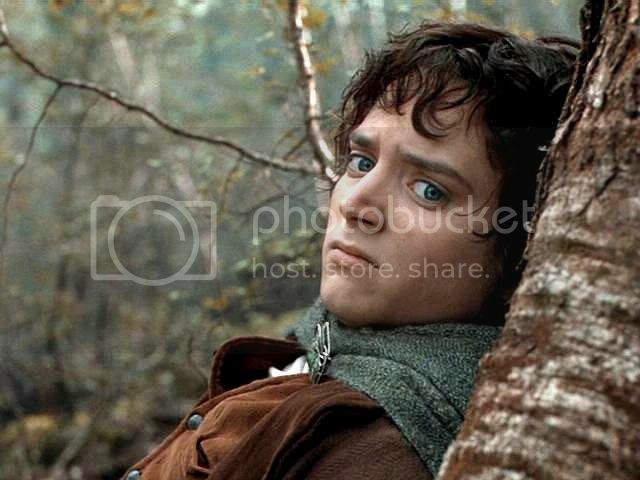 There was this set from Amon Hen to post, plus I had made a series of caps of the "Frodo and Bilbo in the wagon" scene from RotK (while looking for another face for a Frodo Art Travesty). I haven't posted that series yet, either. It really is amazing that one person can display so many emotions in just one sequence of film. Thank you for bringing it to us to witness it in such clear detail. It is so true, Maewyn. And all these faces appear in a matter of moments! Oh, Mechtild! 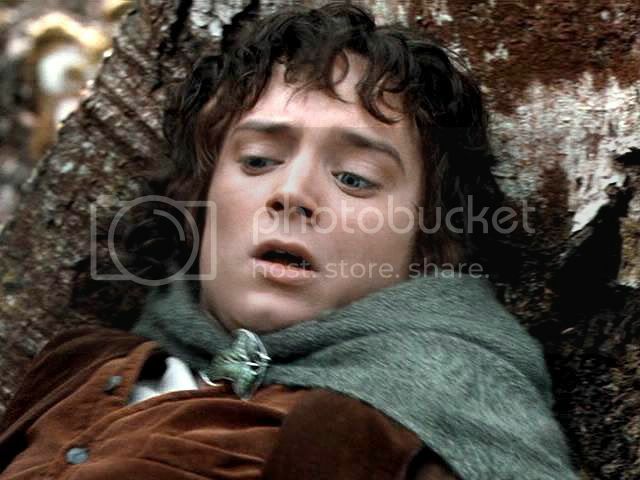 *wipes tear* You caught my most favorite Frodo moment of all. The brilliant forest colors, the face, the emotion, all superb! These are all gems indeed! Stunning, fabulous gems. I can't thank you enough for sharing these! As I've said before - the best pics I've ever seen! Thank you for these--they're beautiful! And your descriptions of them were so insightful! Beautiful.. Thanks for these.. and the commentary is fabulous as always. 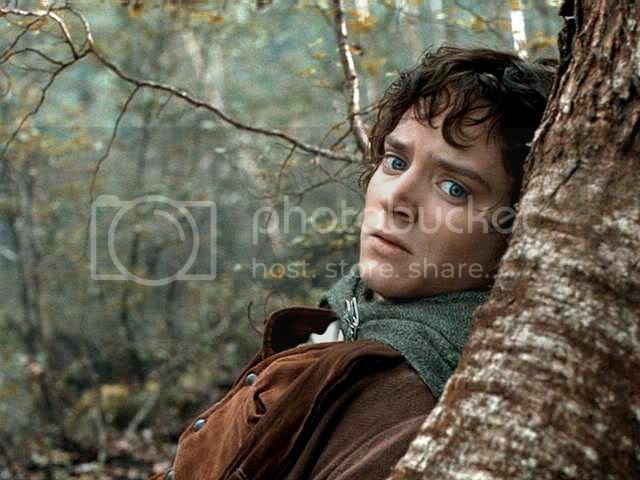 I know you are commenting on this particular scene.. but I have frequently marveled at how this actor can be standing there being himself and then.. with talent that seems supernatural.. the scene starts and Mr.Wood is completely gone and there is Frodo. I can't even put my finger on any one thing that really defines this transformation.. (and you know, I have studied this face!) He just really is someone else. It is spooky. Sorry.. Anonymous above was me. I forgot to log in. He is quite astounding doing this role, I agree. Like a chameleon. And each and every one a beauty. Seriously, though, I think your artist's eye has got something, there, Taerie. I remarked that he really looked different in these, even from other scenes in the films. I think it's in the way he holds his muscles, not just the large groups but the small muscles in the face. Not that he's doing it intentionally; he's just feeling the feelings and thinking the thoughts. But those thoughts and feelings all translate into schemas of muscular tension that literally change the look of his face. Wow, I wish I could look at him all day. I must make an icon with one of these caps. But... which one? All the feelings and emotions he conveys without even a word. 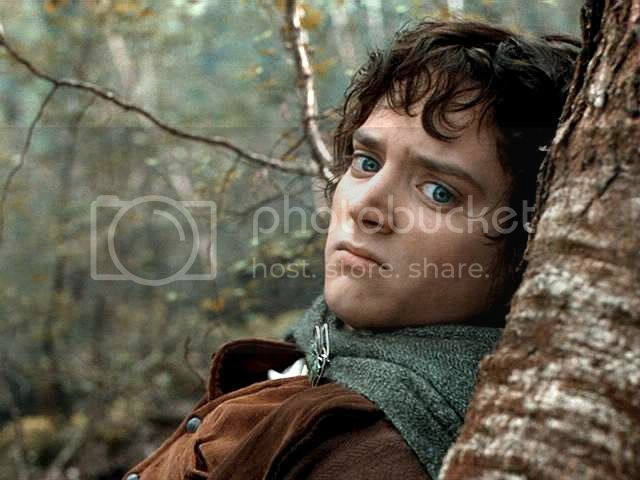 I doubt he will ever have a role like Frodo again, or a director like PJ who realised how to get the best from him. I regret to say I think you are right, Lindenella. But, hopefully, he will go on to play other roles that are worth doing, even if they cannot be "Frodos" or in films as great as LotR. Maybe when he is older. Another series of truly beautiful screencaps, Mechtild. He is exquisite! 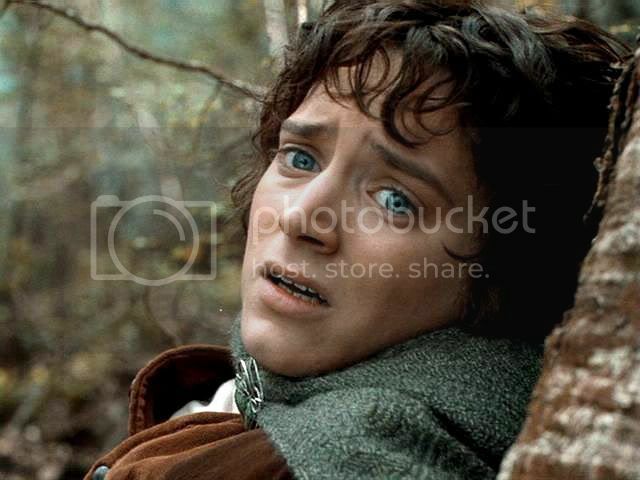 How torn Frodo is in this scene. Still shaken following Boromir's attack, he is reluctant to leave his friends as the orcs draw near. Yet he is bound by his task and has made his choice - I see a look of steely resolve in pics 6 & 7 - he is determined to go on alone. I always enjoy and appreciate your commentary. Thanks so much for sharing. Blossom, how good to see you! (so to speak) Yes, he really is torn in these, but he makes his decision. He will go. Then there's the scene on the banks of the Anduin (which I feel there is no necessity to cap; there are a thousand images of Frodo from that scene). But that is another decision. 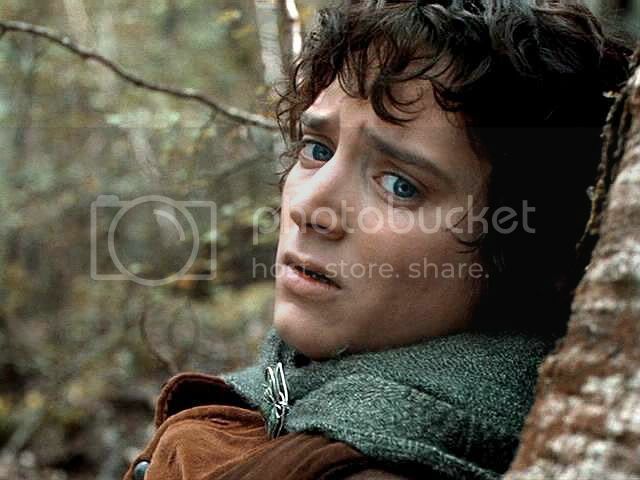 Frodo knows what to do as he stands on the shore, but he has yet to do it. His face is simply an amazing instrument for the playing of human emotion. These caps are absolutely beautiful! Thank you for the comments. Gosh, that was a beautifully turned and appropriate thought, Este. I have never read it. Thank goodness you are here, a reader of the great poets. I'm so glad you enjoyed the caps, Este!